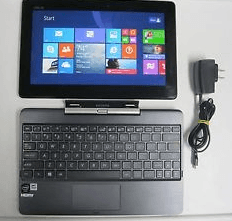 When you have this ASUS Transformer Book T100TA-H1-GR Windows 8.1 tablet, you will not know where to begin to describe it, click here what other says, as it does a lot of things and it has so many features. The tablet itself, and the keyboard are so much better than you can expect it to be, it’s sturdy, you will feel the quality, which to a lot of people, quality means everything. So if you’re expecting it to be feeling cheap, and plasticky, you will likely be disappointed. This ASUS Transformer book device is pretty solid, it will sits on its keyboard nicely, as it isn’t heavier than its keyboard, and it won’t fall backwards like many budget tablets do. With a little click, the tablet will fits its base pretty good, you will feel how secure it is, comfort in use. One of the advantage of having Windows 8 tablet is, you won’t see bloatware installed in your system, just run the install, and you will have 2 or 3 pre-installed Windows program. Take a look a bit here to disable the start screen of Win8. If you get a new T100TA-H1-GR, you should look a paper in the box that contains Microsoft Office (Student and Home version 2013) license number, because this has MS Office 2013 full version. (not trial). Just make sure you’re connected to the internet while validating your license key. 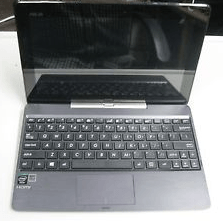 If you want to know the difference between this t100 H1 with the B1 or C1 is, this one has 32GB SSD in the tablet itself, while its keyboard dock has a 500GB HDD. The other two have SSD but one has no keyboard and the other one has keyboard without the hard drive inside. So which one should you choose? Everything depends on what you need. If you need to have a tablet that can store more data and often using the keyboard dock, then this one is recommended, but if you don’t use the keyboard often, then the C1 version is the way to go. The only drawback is probably the battery, how fast it will run out. The initial charge will run about 11 until 12 hours, but you need to do this kind of thing with all of new devices anyway. Battery life is more than 11 hours. Just small tips, you can charge your device before you go to bed or sleep, and it should be finished charging when you wake up. The ASUS Transformer Book T100TA-H1-GR screen is only a 720p resolution, it could be better at 1080p, but looking at the price again, it’s really fine, you need to pay more than 600 bucks if you want 1080p screen tablets with Windows 8.1 (not RT version). Also unless you got the devices next to each other, you wouldn’t notice the difference with 1080p too much. To sum up? Get this T100TA-H1-GR if you need portability, a sleek and light laptop formed tablet that run the full Windows 8.1 version and Microsoft Office, and other computing task. But if you need a laptop that do your full PC work, then I suggest you to look full laptop or desktop. You will love this tablet so much, it’s not an RT version tablet.